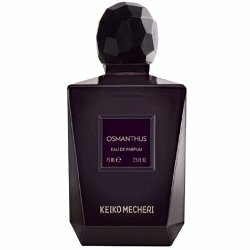 Like yesterday's Datura Noir by Serge Lutens, Keiko Mecheri's Osmanthus highlights floral notes of osmanthus, tuberose, and datura. And like Datura Noir, Osmanthus is also a lush, creamy tropical scent, but here the florals pretty much stand on their own, tempered only by a light veil of green. Worn next to the Datura Noir, it feels comparatively light and airy, and the clarity allows the buttery apricot undertones of the osmanthus to shine through. Datura Noir has a more of a mysterious air about it; Osmanthus might be its younger, more straightforward, possibly less interesting cousin. When Datura Noir works, it has the power to stun with its beauty; Osmanthus is beautiful in its own right, and is my favorite of the two, but I don't know that I would go so far as to call it stunning. On the other hand, I've never been tempted to wash it off, as I have with the more fickle Datura Noir. It never fails to cheer on a cold winter day, and it outlasts Datura Noir every time. The 75 ml bottle of Eau de Parfum is $80, and Osmanthus is also available in bath gel, body lotion, and alcohol-free body mist. For buying information, see the listing for Keiko Mecheri under Perfume Houses. This sounds pretty and summery. Re: not being tempted to wash it off. I guess the more scents I sample the higher is my tolerance level. So very few things qualify as “scrubbers” now. M, I know exactly what you mean! Datura Noir doesn't qualify as a scrubber in the real sense anyway — it is a gorgeous scent. Sometimes it just doesn't work for me. This one is a little heavy on the tuberose for me. It drowns all the other notes out. I'm a big Keiko fan, I own 10 bottle from this line, but not this one. For Osmanthus I prefer The Different Co and Ormonde Jayne's versions. I want to test this! I understand that Barneys is selling out its current stock of KM for $30. a bottle. Genie des Bois is already sold out! According to an MUA friend, KM is re-packaging and re-doing the bottle, so the old stock must go. So, I guess we should get 'em while we can! V, Love the OJ too, of course. The TDC one I have tried so many times now that I must give up: it just doesn't work for me. R, heard that too, and have been holding myself down to keep myself from calling to see if they still have Bois de Santal. Am confused about the repackaging though. I heard the same story, but they just repackaged within the last year or so! No Santal. They were out when I was there in September and said they would call me but it never came in. I checked again when the sale started. I wonder what's left? I friend picked up Wild Berries for me a few weeks ago. R, I tested KM Osmanthus today, too & I have to admit that I prefer the SL version. Both get equally sweet on my skin, but SL is a bit more creamy & sophisticated – but I´m generally no big KM fan, so I might be a bit biased. I just wonder why KM makes so many fragrances that are close relatives of SL scents?! Agree that the SL is more sophisticated, but still like the KM better! Also agree that several of the KMs are close relatives of the SLs. I have no idea why, but the similarities have certainly been noted on the fragrance boards. On the bottle change, I heard that she sold the design of the current bottle to Guerlain. And I heard a rumor that the new ones are square. Whaaat??? V, I suppose anything is possible, but that is hard to believe. I understand that the bottles for the 3 new Guerlains are the same tall rectangle shape (as in SL export too) but they would hardly need to buy the shape from KM — there was nothing particularly distinctive about the cap, after all. If the new bottles are square, hope they are not (as with the last repackaging) also less juice for more money. R, thanks for clarifying that Osmanthus is the same as Fleurs d'Osmanthus. I was under the impression they were different and wondered why she gave them similar names! I agree completely about wearying of Datura Noir. This doesn't happen with Fleurs d'Osmanthus. For that reason, Fleurs is more wearable than DN for me. I love the idea of this fragrance, however I do not reach for it much. Like you, I find Datura Noir more sophisticated, but in the end, I do not wear it much either. Iris, I don't really know what is up with the name. It used to be Fleurs d'Osmanthus. The KM site shows just “Osmanthus” now, and it looks like some retailers use one name, some use the other. But yes, it is just one scent! Have you tried the KM Bois de Santal? It also has lots of osmanthus. I hoped to review it tomorrow but can't find my darn sample! V, Have to admit that I don't reach for *anything* often — have too much for any one fragrance to get attention — but do find the KM perfect on a freezing cold day like today. Don't even want to know the temperature where you are!! Has to be better than here. When I read 'this is a little heavy on the tuberose for me' I knew the writer was NOT Victoria F! Sorry, Snookums. It's cold here, too. I just picked up Bois de Santal and Fleurs d'Osmanthus from Barneys (each for $30). These two scents, along with Grenades, are my favorites from KM. Iris, congrats, that is a great deal! Sample appears gone. Have a sort of nagging feeling that I passed it on to someone who wanted to try it. Oh well! Sorry to hear that L! Looks like we all need to move out West. This is not a summery scent to me at all. I love it, but find it to be very heavy and rich. I'm much more cynical than you, R, and I think I can guess why 'several of the KMs are close relatives of the SLs'. LOL! LOL! Well, J, if she is actively copying the SL line, I wish she'd get to work on Iris Silver Mist. But seriously, these aren't copies, even if they are “inspired” by the SLs. Loukhoum is a very different fragrance from Rahat Loukoum, and the same with Osmanthus. More like variations on a theme, perhaps. They changed the bottle and reduced the amount of juice. I can't imagine why they would change it again so soon unless they plan to charge more or give less. I so vastly prefer SL Datura Noir that they seem like utterly different fragrances. KM is much lighter and for day wear. DN is bewitching and all-night. Hard to believe they would up the price again so soon! Still haven't seen any signs of the new packaging. I've been wearing this one for a couple days now and I really really love it. I'm a pretty big fan of tuberose, so maybe that's why, but this feel perfect right now (we're having single-digit weather where I live). It's pretty light, to me, although a bit heady. I wasn't overly impressed with the lasting power yesterday, but maybe I would just becoming used to the smell because I would still catch a whiff of it every once in a while, even though I couldn't smell it off my wrist. Either way, this one is very beautifu. I'm sorely tempted to own a bottle. Or at least the body wash…I think this would traslate into some wonderful bath products. I know the feeling…my Dad just doesn't understand why there's so many bottles on the bathroom counter (my sister and my mom contribute as well). I don't have the heart to tell him that there's even more in the closet, in my room, etc. Poor man- just doesn't understand fragrance addiction.